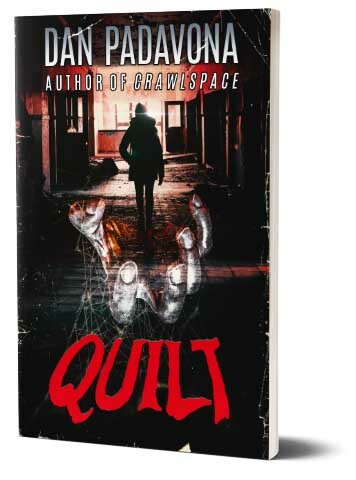 Dan Padavona (author of Crawlspace) has released Quilt, a new splatterpunk horror novel. The story follows a female teacher, who becomes concerned when a promising student from the projects stops coming to school. Eventually she sees no choice but to venture into Jasmine Heights, a city section run by gangs. Something dark begins to follow the teacher, and then the horror kicks up to extreme levels. Asked about the name, “Quilt,” Padavona opted to keep the book title’s meaning a secret. Quilt marks the second consecutive story in which Padavona utilized noted horror author, Chad Lutzke, as editor. Speaking of concise, Quilt is classified as a long novella at its 60-page length. We asked Padavona why he chose to write a novella and if he considered expanding the story into a full novel. Asked if he favors the novella length, Padavona said he does, and will likely release more novellas in the coming months. To join the discussion on Twitter and other social media platforms, use the hashtag #QuiltHorror. Download Quilt on Amazon now.